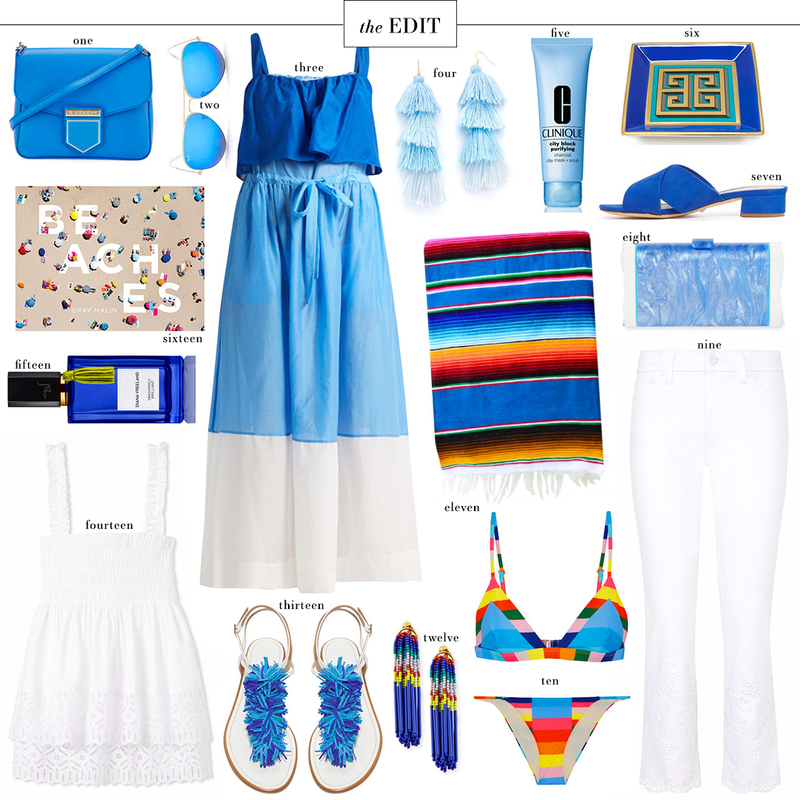 I continue to be envious of everyone on spring break… this week’s EDIT is more proof of that. While I won’t be going on a beach trip anytime soon, I am actually headed to New Orleans with my mom, sister, grandmother and stepdad in a couple of weeks! It’s been years since I’ve been to Nola. The last time was on a fraternity away weekend with my college boyfriend! Needless to say I don’t remember a whole lot from that trip, but I know we didn’t do all that much exploring outside of Bourbon Street. I’m looking forward to getting to know the city in a brand new light! We’ll be doing some shopping (antique shopping for me! ), visiting a couple museums, eating good food, etc. Comment below with any recommendations you have! We’ll be there for several days, so we’ll have lots of time to explore! Loving all of these pretty shades of blue! So fun. Awesome picks! LOVING this bright, bright blue color palette! Nola sounds like the perfect girls getaway, too! I’m dying over all of this- blue envy to the max! I got the Beaches book for Christmas and it’s seriously amazing! Cavan and Shaya are two of my favorite restaurants in New Orleans! Enjoy! Gosh – I love these bold blues so much! I’ve been eyeing that DVF dress – trying to determine if it’s bump friendly. Ha. For home shopping you have to go to Rivers Spencer Interiors, Amanda Talley Studio and Leontine Linens. So many cute shops up and down Magazine St. For a nice dinner, try Restaurant August and get the potato gnocchi, it’s amazing. A great brunch spot is Willa Jean. Have a frose for me! My hubby and I went to NOLA last week for my birthday. We spent one afternoon on Bourbon St. because the people watching is unbeatable. Plus my hubby lives for piano bars. But we both loved the Garden District and Frenchmen St for a more adult vibe. If you decide to visit Frenchmen St., make a reservation at Adolfo’s. Seriously, make a reservation b/c we had to wait 2 hours for a table, but IT WAS WORTH IT! I got the stuffed grouper with ocean sauce. It was one of the best meals I’ve ever eaten. In my opinion, Cafe du Monde is overrated given the insanely long line regardless of the time of day. The beignets at Cafe Beignet were just as good, and we only had to wait about 15 minutes. The biscuits and gravy at Willa Jean (John Besh’s restaurant) were also very tasty! Royal St. is loaded with antique shops and art galleries. Hope you have luck finding some pieces you love. We also enjoyed the Hurricane Katrina exhibit at The Presbytere museum and admission was only $6. My boyfriend and I went to NOLA in December for a pre-Christmas get-away. The Garden District is beautiful and full of historic (and celeb homes (Sandra Bullock, the Mannings, John Goodman). You can google your own walking tour. There is a restaurant there called Coquette which has gotten tons of accolades. Bourbon Street is pretty gross but there are some good spots worth a visit. Jean Lafittes is a cool bar at the very end, It’s in a historic building that is fully lit by candles/lamps. The Carousel Bar at Hotel Monteleone is great for a more adult vibe and has wonderful jazzy music with a club singer. Depending on how much time you have, City Park is worth a visit. It is stunningly beautiful and houses some of the museums. Morning Call cafe in the park has delicious beignets without the Cafe du Monde wait. We didn’t make it to Preservation Hall, but heard their shows are a “must”. I loved New Orleans; the architecture, the ferns hanging on the balconies, bridal parades through the French Quarter. You’ll have a great time! Oh, one last thing: we did a cooking class at New Orleans School of Cooking. They have a demo and an actual cooking class. I can’t speak to the demo but the class was so much fun and I’ve made some of the recipes multiple times since our trip. you must go to Willa Jean!!!! They have the absolute best food and drinks and it’s the perfect lunch spot! And Peche is the perfect dinner spot, their seafood is to die for. And it’s down the street from Ace hotel to get drinks before or after! How fun! New Orleans has become one of my absolute favorite cities. (So much so that I’m currently planning our wedding there, from Chicago.) I agree with many of the recommendations above, and would also add French Antique Shop (225 Royal St.), and Longue Vue House & Gardens, as a fabulous retreat to visit if you want to step away from the city. Enjoy! If you are there on a Sunday, go to Commander’s Palace for their jazz brunch-make reservations and ask to sit in the Garden Room. Have fun! PS-Maddie did my bedroom design here in Houston! She’s the best and oh so talented!